Entrance Music: Drowning Pool "Tear Away"
Quote: When Midnight strikes, you will be ENTERTAINED! Trademark: Drop Kick, Standing Suplex, Lifting Side Slam, Clothesline, Body Slam, Leg Drop, Fist Drop, Chest Chop, Release Catatonic Slam, Top Rope Dropkick, Top Rope Suplex. 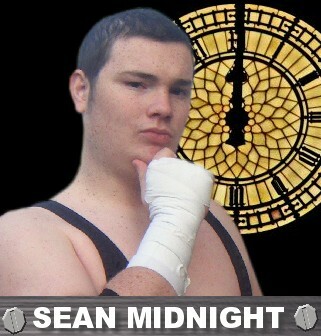 Finisher: Strike at Midnight (Fall Away Powerbomb), Frog Splash. He was seen on Sky Digital, Virgin Media or FreeView! Ran his one-off show, and it was SOLD OUT show with 100+ crowds! To having 'World of Sport' legend, Alan Kilby at his corner.